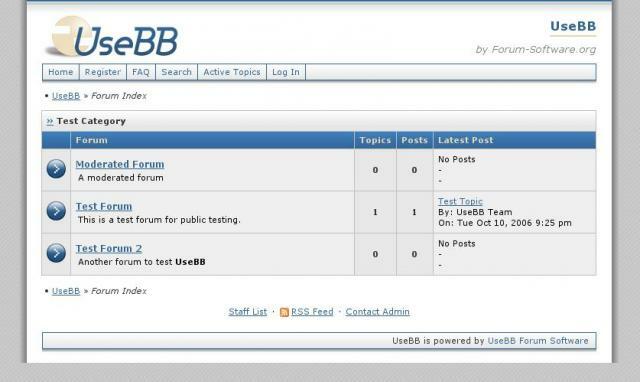 Need to Host your UseBB Forum? UseBB is another PHP/MySQL forum software, with some really good qualities: open source (GPL license), light, developed keeping simplicity and usability in mind, this forum software has good abilities to support small communities. However, UseBB is, for the time being, only compatible with PHP 4, and requires a specific patch to make it compatible with the latest PHP 5.3. February 1st, 2010: Review updated with 1.0.10 version of UseBB. UseBB is recommended for Medium Community. Additional Translations are available in the UseBB Community Forum. Some features will only be available for the next version of UseBB 2.0. Examples are attachments, polls, private messages, subforums and user groups. This is a pity for some of them that are really mandatory for modern forum softwares. Friendly URL are actually ending by the .html extension, that is a good start, but not really helpful for Search Engine Optimizations (SEO). Some details about UseBB features regarding members. The database could be pruned easily in the Administration Panel. Old forum, topics and comments could be removed depending on their age. Members could also be removed if they are not connected since a specified date. This is really good to keep an updated system. Banning Management and IP blacklist could be easily setup, and is really useful in the everyday tasks. By regularly checking the Administration Dashboard, you will be able to see if new updates have been released. Convert an existing forum to UseBB. Secunia Advisories severity affecting UseBB. Secunia Advisories impact affecting UseBB. Does UseBB correctly follow (X)HTML and CSS norms? UseBB is a simple and useful forum software, which could be compared in terms of features to PunBB or FluxBB. This forum software, which respects W3C norms, could easily be installed to support and manage a little community. It provides many important features, like antispam and a really powerful administration interface, but however lacks of classic features like polls, user groups or else. This should however no longer the case with UseBB 2.0, that we wait for impatiently! Compare UseBB vs PhpBB 3 vs Simple Machines 2. Ask your questions to the UseBB Community Forum. Get Users Reviews about UseBB and Share your experience.